Simon and I decided we would do a taste2taste off with recipes from UK vs USA as we love a bit of healthy competition. Simon thought brunch was a good subject especially as it’s Labor day weekend. I chose my twist on a Spanish Tortilla omelette as a perfect brunch dish, inspired by my recent Mediterranean holiday, surely a winner? 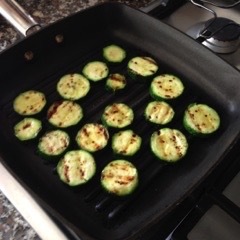 Heat a chargrill pan and cook your courgettes over a medium heat for a few minutes each side until cooked. Leave to cool. 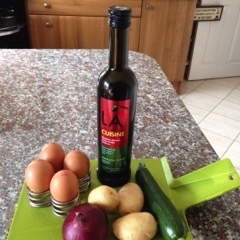 Heat olive oil in a small omelette pan until hot and add sliced potatoes and season with salt & pepper. Cover and cook on a low to medium heat for 10 minutes. Add the sliced onions, herbs. Continue cooking gently for another 10 minutes until soft. Drain the potato and onion slices in a sieve over a bowl to catch any excess oil. 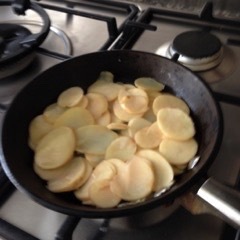 Add potato and onion to beaten egg, season with salt & pepper, mix gently and leave for 5 minutes. Add a tablespoon of drained oil back to pan and heat. Add mixture and cook very gently for about 8-10 minutes until the tortilla starts to set. 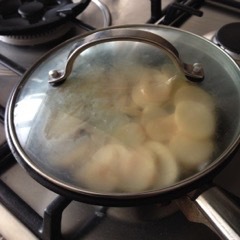 If you’re feeling brave slide onto a plate, pan on top and turn over and cook for a further 5 minutes until set. Otherwise cook the top for a few minutes under a medium grill. 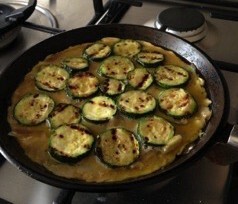 Add the courgettes on top and grill for 2 minutes to warm. 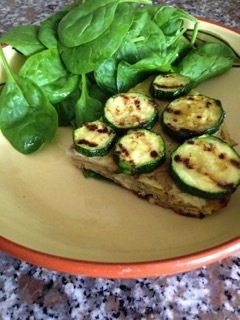 Serve with some fresh spinach. Can be eaten warm or cold. Tortilla omelette a taste2taste off winner from UK (& Spain)? Check out Simon’s Labor day post tomorrow & then decide!